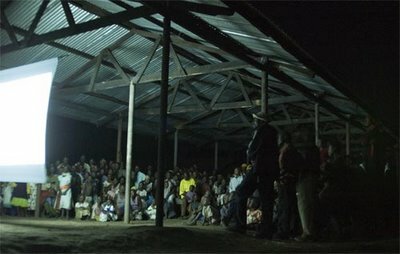 Two days after I returned from Kampala I had the opportunity to help the indigenous church leaders show the Jesus film in lubwise in a village called Ingamba in Kasitu sub-county. It was both a blessing and a struggle. I was weary from my previous weeks of traveling to Karugutu, Ft. Portal, and Kampala. In addition I was the only missionary who was attending the event (because the goal is the have the local church leadership be as much in charge as possible) and I was only there because they needed someone who know how to set up and run the dvd through the projector. After Michael dropped me off, I set up the equipment in a pavilion at a local school. Immediately I was surrounded by many locals who were very curious about the Muzungu (that's me, it means foreigner) and what I was doing. The church leaders, some of which spoke English, all had to go back to the village before showing the film and so that left me and all the non-english speakers up at the school. There was definitely a good hour of me staring at them and them staring at me, because there's not much else you can do when you can't communicate. (Although I did have success making the kids laugh with funny faces or raising my eyebrows. But that's not saying much, because as a Muzungu you're pretty funny to begin with to them). At sundown we showed the film. I don't know if you are familiar with the Jesus film, but for me it was still entertaining even though I couldn't understand it. One of the more interesting things is that when it was dubbed over in lubwisi, they tried to make the voices match the lips of the movie as much as possible, which leads to some comedic moments (for an observer who doesn't understand the language). All in all, I think the movie had a good impact of the village and them understanding more of what the crusade was about (the film was on one night of a multi day crusade). I counted at least 100 people who where there when I was setting up and more came after it got dark. I would say that there was likely 150-200 people there from the local village. At the end, there were many people who raised their hands as an indication to receive Christ and the church leaders had planned to follow up with the locals and I truly hope that it happens/happened. After the movie I had dinner with the church leaders. Dinner was rice, cassava flour, a medallion of meat and beans in soupu. Afterwards I slept on a thermarest on the floor of room in a mud house. It was a fitful night's sleep because somehow even when I tried lying in both directions it seemed that my head was lower than my feet. Try to figure out how that works. Maybe a hump in the middle of the floor? Possible with a dirt floor. I survived the night and Jesus was proclaimed, praise God for both. ParadoxUganda - Scott and Jennifer M.
This is Life - Derek & Lauren W.
Steadfast Joy - Travis & Amy J. Wonder and Wildness of Life - Sarah C.
We Walk Slow - Michael & Lesley S.
Copyright 2006-2014 Joshua Dickenson. Simple theme. Powered by Blogger.